Claddagh rings are classically simple designs, but they are quite lovely. There are many options for lovely engagement and wedding rings featuring this traditional motif that symbolizes the treasured combination of love, loyalty and friendship. The following slides feature ring options that are available from Amazon.com. Click each image for details and ordering information. This lovely sterling silver cluster allows you to combine your appreciation for the Claddagh design with your fondness for diamonds. This lovely wedding band features the phrase "Anam Cara" which means "soul mate" or "soul friend" in Celtic along with the Claddagh symbol. It provides a lovely sentiment on your wedding day, and every day of your lives together as a married couple. Symbolize the special unity of your marriage by choosing a Claddagh ring that also features a Trinity Knot design. If you like the idea of a Claddagh engagement ring with a solitaire stone, but you want something more unexpected than a diamond, consider a gemstone like the lovely aquamarine pictured here. This two-tone Claddagh ring is a lovely engagement ring option for brides who prefer to stick with silver and gold rather than introduce diamonds or gemstones into their jewelry. It can be paired with either a plain white or yellow gold band or worn on its own. This lovely thin sterling silver band is a perfect ladies' wedding ring. It will look beautiful with a traditional engagement ring, paired with a traditional Claddagh ring (with or without a gemstone) or on its own. This beautiful emerald and cubic zirconia bridal set incorporates the Claddagh design with a traditionally Celtic created emerald in the center. This rhodium and gold plated stacking set is a unique twist on the claddagh design. It's a great option for a bride who wants a traditional Irish wedding ring, but also wants something unique. 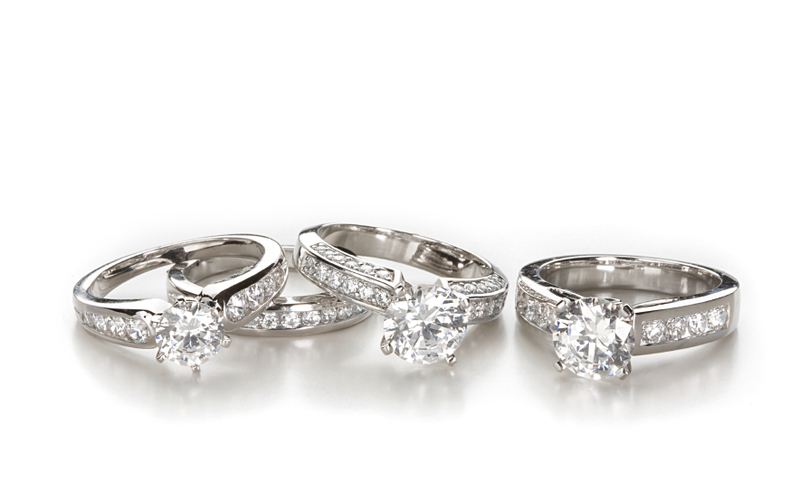 With so many options, you can surely find Claddagh rings that suit your preferences.